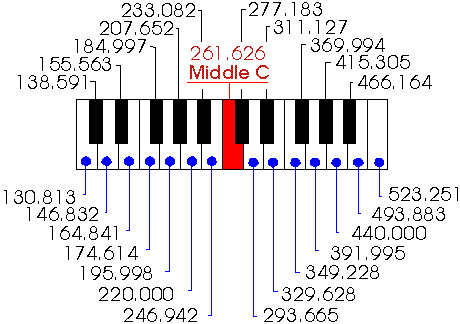 The figures above are calculated for the equal temperament system of tuning. This is arguably the most commonly used tuning system today. It is derived through the equal division of the octave logarithmically into twelve segments. Using this chart, the user can extrapolate notes beyond the scope of the chart itself by applying the principle that any given note's frequency when doubled produces a note an octave higher, while the converse is also true. For more information, try these!